PS: It’s been brilliant reading all the comments on yesterday’s blog post and seeing what everyone else is doing and eating!!!!! Thanks for all the input AND the useful historical information being shared!!! 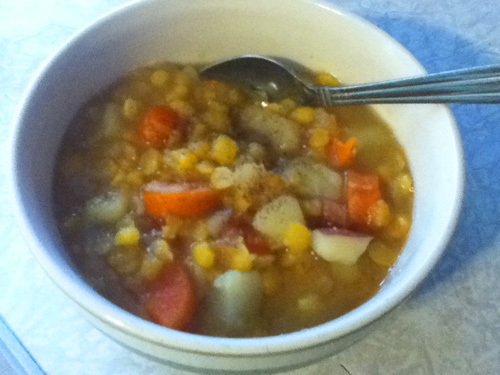 Today’s yellow split pea soup. About 400 cals and 20 grams of protein per large bowl. Cost = 30 p per bowl. 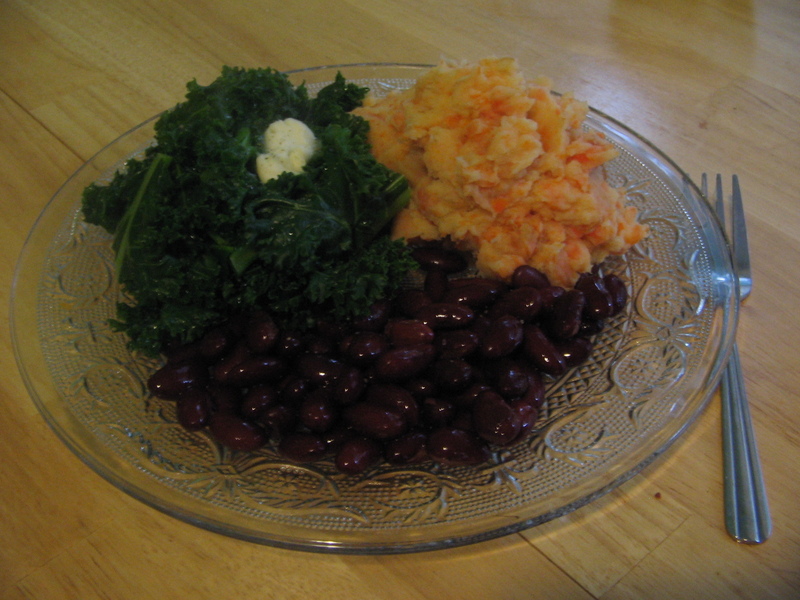 Dinner tonight was carrot and potato mash served with kidney beans and kale. Lots of iron and protein, fibre and vitamins. Cost about 60p per portion and around 750 calories. That is a wonderfully veggie filled menu! I love reading your blog and following you on facebook. I have learned so much from you! Thank you! Thanks so much for sharing your menus with us. I find it helps me to get ideas on variation. I was so inspired to try WW2 diet, took a while to get used to all those veggies and pulses but actually prefer it now to a meat based diet…having said that I bought a huge chicken at the weekend so it will be chicken curry, sweet and sour, soup , and all things chook until it has all gone, can’t wait for my big VegBox to arrive this week! Yep to the midnight bathroom trip! Today is much the same as yesterday! 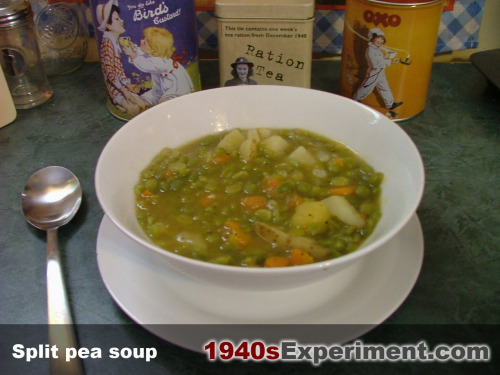 Grandma used to often make split pea soup. That or ham and bean soup were her favorites (boil a ham bone in with dry beans and black eye peas, simmer all day, add a bit of seasoning & your good to go.) Very filling, and tastes good too! fyi I’m 29, grandma grew up on a farm outside an Indian reservation in the great depression with her 10 brothers and sisters. Only 7 of them made it past child hood, 5 of them to adults. Grandma married grandpa before he went off to war the second time, she was a new housewife in W.Va at first, then in 1951 grandpa bought a plot of land in ohio, They had their first of 4 children, lived in what later became grandpas tool shed while he built their house from the ground up…root cellar, hidden passage ways & all. Grandpa died of old age when I was 14, grandma has dementia and it’s very bad now. Your posts remind me of the good ol days with both of them. Helping grandma in the kitchen where she taught me how to cook, helping grandpa in the garden where he taught me how to grow my own food…and flowers and trees that he sold for extra money. I am not sure if it would be useful or even helpful, but when ‘growing your own’ you are pretty much consigned to eating seasonably! We are currently making a real concerted effort to ‘grow what we eat, and eat what we grow’ (if anyone has a recipe for buttercups and bindweed I would appreciate it as those are two things I seem good at growing! 😉 ). We have noticed quite a distinct difference in the huge variety in the shops and what we are able to eat from our garden! Obviously something like bananas wasn’t ever going to be on the menu at all, but right now we have spinach, kale and spring greens, whilst the summer seedlings are growing with promises of beetroot, lettuce, rocket, new potatoes and baby carrots….but the pumpkins, jacket potatoes, decent sized carrots, parsnips, and cabbages will not be ready to eat until late autumn and through the winter. I have no idea how much difference a seasonal diet has on weight or health, but I am fairly sure that those rationed during WW2 would have been very much restricted to a seasonal diet. I think a local and seasonal diet is something most people could benefit from. I was recently reading further about “food deserts” (check out this site for an intro/overview: http://www.cdc.gov/features/fooddeserts/) and it reminded me again just how lucky I am to have access to fresh and bountiful local product. I didn’t have the late-night loo adventure, but then honestly what I ate yesterday is essentially the same as what I eat most days. 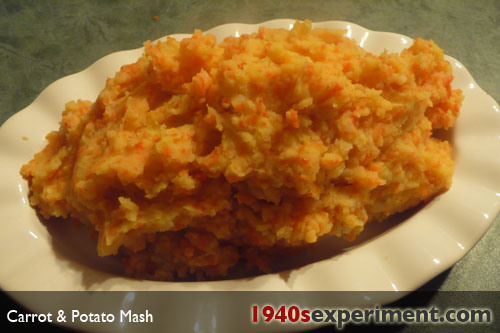 Probably more starch – because I had both potatoes and bread, and I usually don’t. I made toad in the hole served with home made onion gravy, red beets and green beans. For breakfast I had a slice of whole wheat bread with Dickinson’s strawberry preserves and a cuppa tea. Oh I now have a craving for toad in the hole. I haven’t made that for ages. I have the added complication of having to be gluten free, but usually I can manage a fair impersonation of real toad. Might have to get some sausages as part of next weeks rations. Why not make some Lentil sausages, mashed potato and cooked green lentils with lots of garlic and herbs..use them in a batter for a Tasty Toad without using your meat ration at all! This helps with eat what you grow, and also for foraging, and even gives recipes to try. Good luck. The animal sources of protein as per the ration books was ham, bacon, meat, milk, cheese and an egg. Fish was not rationed but expensive (same as today). None of these items was generous in quantity. I have found that it is quite easy to manage on these small amounts if you just use them for one or at most two meals during the day. I think a lot depends on when you are hungriest because protein does keep you feeling fuller longer. I am one of those who is hungriest in the morning. This allows us to have for breakfast or lunch) a one egg omelet with some cheese once a week or a toasted bacon, lettuce and tomato sandwich or a fried egg and ham once a week or tea biscuits with cheese and ham. The fish I use for lunches and sometimes dinners and the meat I spread out during the week for dinner when we have had a day without any of the other animal protein sources. The milk is used for tea and oatmeal. I forgot to add that I do not bake much now other than bread and pies. The butter, margerine and cooking fat (oil) are quite sparse even for this baking as are the preserves and sugar – but that all helps with weight loss. I am sticking to seasonal fruit for pies. Protein from animals may have been low but beans and pulses are high in protein and were used a great deal as you could get loads for your points rations, add them to veggie casseroles to fill you up or make lentil burgers, bean chilli, barley cooked with a thick gravy is a good substitute for mince , delicious with lots of veg and a big herby dumpling! Well as you all settle down I’m heading into day 3, and it wasn’t until Carolyn mentioned it that I thought “Umm yep, I’m going to the loo a lot”. The food so far has been fantastic. The odd tummy grumble but nothing bothersome. The worst aspect is rationing myself on tea. The beef and prune hot pot was just amazing, so shocked by that one! Having a tiny serve of left over for lunch today. Porridge for brekkie. Going to trawl the recipes here for a dinner recipe. It’s been so interesting to read eveyone’s posts, it doesn’t make this feel like ‘dieting’ at all. I look forward now to logging on and seeing what’s happening. As well as the rationing there were food items bought on points – thankfully you could get rice and rolled oats. Beans were bought on points. I’m beggining to think we may need a SPIV on this site to ‘help us out’ with a few rationed goodies now and then! Guess I wont be making anything with salmon in it…. The values listed are not official MofF values, unfortunately – those are not really available online. There are some publications which reference them, but most do not give a complete listing of them. One of the links I posted has the 1946 values, and references the wartime values as well. Well I don’t really count calories but have been doing so incase it’s helpful to anyone. 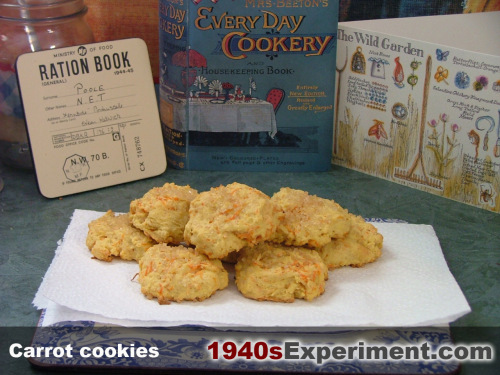 I worked out today that including my two bowls of yellow split pea soup for lunch (but in the end I didn’t bake carrot cookies as quite honestly I was full up!) I consumed around 2000 cals. I went to the gym for an hour- did a 30 minute walk, 10 minutes cycling and about 20 minutes doing various weight machines. Reading everyone’s experiences tonight has been amazing!!! And I LOVE hearing about what food people are cooking!!! Mmmmm now I need to decide what to eat tomorrow! I’m so glad you’re back to writing regularly – I’ve really missed your blog! Things looked tasty on this menu. I can point you toward a few more sources as well. Just let me know. Hiya, I’m so pleased you have started this blog again and you’ve actually inspired me at 66 to join a gym for the first time in my life ;-). You are absolutely correct that it is extremely difficult to find specific information. This is the first time I have found points information grouped together. I was actually looking for the ration and points information on beans and other legumes. My best source of WW2 homefront information has always been my Scots friend who lived it. For a little bit of a different taste add a leek to your potato and carrot mash(the white part of the leek and save the green for making soup). If you have cheese left over from your ration you can grate on top and then broil until cheese bubbles and melts.